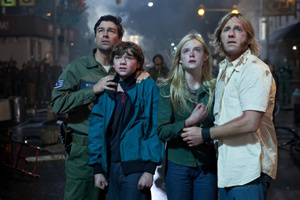 Super 8 is a fun throwback to the ’80s, when Steven Spielberg productions dominated the summer movie season. That’s the movie’s biggest strength and also its primary weakness; there isn’t all that much new here. Movies like Super 8 either flourish or flounder almost entirely based on the quality of the cast. It’s a tricky proposition to create a credible, believable adventure movie when the bulk of the cast is in their early teens. But that’s one of Spielberg’s specialties. He knows, perhaps better than any other director out there, how to get terrific performances from tweens and teens. Take a look at Spielberg-directed flicks from the ’80s, movies like E.T. The Extra-terrestrial (Drew Barrymore, Henry Thomas) and Empire of the Sun (Christian Bale) for excellent examples of what the man can do with young, latent talent. That knack oftentimes extended out to the plethora of Spielberg-produced movies of the same era, Joe Dante’s Gremlins (Corey Feldman), Richard Donner’s The Goonies (Sean Astin, Josh Brolin), Tobe Hooper’s Poltergeist (Heather O’Rourke) among them. Alas, while other classics include the Back to the Future series, the era also had misfires like *batteries not included (co-written by Brad Bird) and Harry and the Hendersons, smaller movies that should’ve stayed on the small screen as episodes of Amazing Stories. Super 8 feels like it has bits and pieces of all those titles. Round out the sundry allusions with Spielberg’s 1977 Christmas release masterpiece, Close Encounters of the Third Kind, and Jaws, the 1975 movie that initiated the whole concept of the summer blockbuster. This time around, Spielberg’s produced and J.J. Abrams, the new-millennium wunderkind behind Lost and Star Trek’s big screen reboot, has written and directed a story about a group of school kids trying to make a zombie movie for submittal to a film festival. It’s 1979 and the Super 8 film format is the medium of choice. Well, it’s 1979 and the Super 8 film format is pretty much the only medium. For little Joe Lamb (newcomer Joel Courtney) it’s a bittersweet time. School’s out for the summer, but his mom died in an accident at the steel mill four months earlier. His dad (Kyle Chandler, Peter Jackson’s King Kong) is a deputy struggling to keep it all together as a single father. Instead of making a silly movie, he’d rather his son go away to baseball camp for the summer; it’d be good for both of them, he says. Naturally, Joe sticks with the plan and forges ahead with his friends in their movie venture. As fate would have it, a clandestine film shoot at a tiny rural train station leads to all sorts of mayhem and intrigue. Bizarrely, a pickup truck races onto the tracks and crashes into the train head on. Why? What the heck was the train carrying? Dropped during the panic of the disaster unfolding, the Super 8 camera captures some startling footage of the event. Cue the John Williams... er... Michael Giacchino music as the government comes in to clean up the mess. Abrams manages to set the perfect tone in Super 8. The kids are in families of various degrees of stability. Joe and Alice (Elle Fanning, The Curious Case of Benjamin Button) are in broken homes; both are motherless. On the other hand, Charles (another newcomer, Riley Griffiths) is part of a boisterous, large family with siblings and friendly, loving parents. Abrams really captures lightning in a bottle with his cast of up-and-comers. Fanning in particular demonstrates a range well beyond her 13 years. But Courtney and Griffiths also come across as complete naturals in front of the camera. Their characters are grounded with a refreshing sense of reality that’s absent in most modern fare, such as the Transformers series (modern-day Spielberg productions). The real magic here is the chemistry between the kids. Having a girl around at that age (should) be kinda gross, but when Alice starts acting, playing the role of a loving wife in the zombie flick, the guys are left speechless. She’s good. Really good. While Charles hammers home the need for a great story and production value in order to get their film into the festival, it’s clear Abrams has studied up on the master’s work, using many of the storytelling tricks found in the Spielberg playbook. For one thing, there’s a massive beast terrorizing the community, but it’s seen only in flashes, a full view obscured by things like gas station signs, strategic camera angles, and snappy editing. Super 8 also has a lot of heart. Boatloads. Amidst the heartbreak of the broken homes and scary goings-on in the fair town of Lillian, the family ties and themes of love, loss, and forgiveness all pull together nicely at the movie’s conclusion. Alas, even with all that goodness Super 8 doesn’t quite hit it out of the park. The train wreck is overblown, filling the screen with chunks of metal and debris flying through the air, creating an obstacle course for the kids to run through as they try to run away from the terrifying scene. As much as the kids come across as real, that particular sequence feels wholly unrealistic. Especially when it turns out the truck driver survived his mad drive into the train. And getting back to Spielberg’s playbook, the overwhelming sensation throughout the movie is one of déjà vu. For young audiences today, Super 8 will most certainly be a fun thrill ride with wholesome characters, but for those who are already familiar with ’80s fantasies, the experience is a mixed blessing of an exciting new cast and a nostalgic familiarity with the narrative.